Tala is the curator of the Inner Mongolia Museum and the director of the Department of Archaeology, Cultural Relics and Museology at Inner Mongolia Normal University. He is also a member of the council of the Archaeological Society of China and a visiting professor of the Research Center for Chinese Frontier Archaeology at Jilin University. His main research areas include the prehistoric culture of East Inner Mongolia region, and the archaeological culture of the Bronze Age as well as archaeological studies on the Liao Dynasty (916-1125) and the Jin Dynasty (1115-1234). If a city can be likened to a book, then museums are the catalogues. The Inner Mongolia Museum, a regional museum located in the city of Hohhot, the Inner Mongolia Autonomous Region, is the region’s only national first-level museum and is essential to showcasing Inner Mongolia’s political, cultural, economic and social life. How does the museum relate to the regional development of Inner Mongolia? What is the strategic position of the museum in supporting China’s “Belt and Road” initiative? 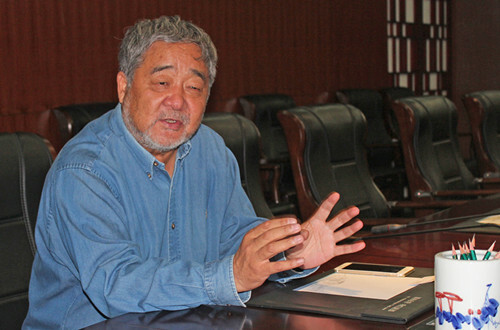 A CSSN (Chinese Social Sciences Net) reporter interviewed Professor Tala, the curator of the Inner Mongolia Museum to gain a deeper understanding of the Museum’s artifact collection and field archaeology. CSSN: You mentioned in previous interviews that museums should be an encyclopedia. Could you elaborate on this? What do you think is the role that a museum plays in preserving the legacy of ethnic culture and boosting urban development? Tala: Each regional museum embodies the cultural landscape of the particular area where it is located, either from the perspective of its architectural design or its cultural implication. Combining the static and dynamic means of exhibition, it usually merges traditional displays with digitalization. When people come to the Inner Mongolia Museum, what they see is the complete veins through which Inner Mongolia emerged, both economically and ethnically. Therefore, despite the visitors’ interest, be it the jade artifacts of Hongshan culture [a Neolithic culture that is considered by many as the important source of early Chinese civilization] or the bronzeware, they would get a general understanding of the Inner Mongolian culture and its ethnic traditions as a whole. Unlike print and television media, a museum has much wider coverage. Television, though it has the largest audience, is only capable of transmitting information one piece after another in sequence to the audience each time, which means that what the audiences watch at one particular moment might not be what they actually want. The library also covers a wide range of subjects, but information in the book on the shelf, after all, is presented not through objects but words. The museum is different. One can directly appreciate the cultural relics and collections. At the same time, the Inner Mongolia Museum hosts academic lectures and exhibitions on particular themes. It receives about 2 million visitors of different ages and educational backgrounds each year. CSSN: Specialized knowledge from a particular field might be needed to appreciate some of the exhibitions. What measures has the Inner Mongolia Museum taken to enable common visitors to internalize the knowledge behind those artifacts? Tala: The traditional way of artifact exhibition is to label the artifact with either words or charts, but not all the visitors are able to comprehend the entire picture. So we are thinking about coming up with a way to innovate the form of display. The national program of smart museums in China is now implementing plans to blend the traditional way of exhibition and digitalization, and the Inner Mongolia Museum was designated as one of the country’s six pilot smart museums. To embrace the 70th anniversary of the establishment of the Inner Mongolia Autonomous Region in May this year, we plan to set up a digital exhibition hall, and so far, more than 1,000 artifacts have been digitally enhanced. We also initiated the mobile museum program, which brings the artifacts housed in the museum out to the frontiers, military camps, pastoral areas and the factories. CSSN: You are also a well-known archaeologist. On May 16 last year, China’s top 10 archaeological discoveries were released and one of them was the tomb of the queen from Liao Dynasty (916-1125) unearthed in Duolun County, Inner Mongolia Autonomous Region. Could you talk about how you feel each time you hear about a new discovery? Compared with your previous work in field archaeology, what do you think are the major differences between your role as a curator and an archaeologist? Tala: People from any region get excited when they learn that a discovery in their own region has been listed among the top 10 national archaeological discoveries. Compared with Henan Province in central China, the discoveries in Inner Mongolia are relatively few, but it is the site of one top discovery every year. The year before last, the imperial tombs from the Northern Wei Dynasty (386-557) were found in Zhengxiangbai Banner [county-level administrative division] , Xilin Gol League, West Inner Mongolia. The Inner Mongolia’s archaeological discoveries that were listed in China’s annual top 10 in this field were mostly those dating from the Yuan Dynasty (1271-1368), early Northern Wei Dynasty and Liao Dynasty—this can be attributed to the geological advantage of Inner Mongolia region. I was an archaeological worker and I still am. I visited Zhenglan Banner last year for the archaeological excavation of the Site of Xanadu, which Kublai Khan used as a base when he established the Yuan Dynasty that ruled China over a century. It was the first World Heritage Site in Inner Mongolia, and I have been engaged in the archaeological work at the site for many years. To me, there is not much difference between being a curator and an archaeologist, because the museum job cannot stand on its own without field archaeology. The two are closely related with each other—the museum’s items on display are mostly obtained from the archaeological findings. CSSN: Inner Mongolia prioritizes the Steppe Silk Road in its strategic development plan and there has been an upsurge of studies on the Steppe Silk Road in the region. In your opinion, how does the Inner Mongolia Museum play its role in response to the national strategy of the “Belt and Road” initiative? Tala: We all know that there is 21st Century Maritime Silk Road, Overland Silk Road, and Inner Mongolia has its Steppe Silk Road, which was proposed based on the experience of archaeological excavation and scientific investigations. Trading goods and exchanging culture, the steppe route was an active precursor of the Silk Road. The Silk Road in the traditional sense is east-to-west, but the Steppe Silk Road of Inner Mongolia stretches itself both east-to-west and south-to-north, which involves Inner Mongolia’s cultural integration with the Central Plain and Eurasia. Currently, Inner Mongolia proposes the vision to open itself further northward to support the “Belt and Road” initiative—this is the also the task of Inner Mongolia Museum since it is located on the important node of North China’s Steppe Silk Road. We have frequent and fruitful exchanges with the People’s Republic of Mongolia and Russia through such ventures as the joint talent training program with the campus museums, the exchanges of experts and scholars on both sides and exhibition program cooperation between museums. Both countries are earnest partners with us in the promotion of the Steppe Silk Road.